Suddenly Texas prison officials are banning prisoners from having people outside of prison maintain social media accounts for them. Since prisoners do not otherwise have direct access to the internet we can’t manage our own social-media accounts. Officials are taking advantage of certain social media providers’ rules that forbid one from maintaining a social media account for someone else, in order to shut down those accounts. On April 14, 2016, Jason Clark, the spokesman for the Texas Department of Criminal Justice (TDCJ) [sic! ], announced that a new rule had gone into effect in the TDCJ imposing this ban. He claims the rule’s purpose is to block prisoners from selling items they create to the public, and allegedly to prevent prisoners from harassing crime victims and their families, and carrying on criminal enterprises. He gave not one specific example of any such abuses of social media by prisoners; the obvious purpose as always is to incite public prejudice and fear through demagoguery to justify suppressing otherwise perfectly legal activities. What he did offer one example of was one prisoner, selected for the notoriety of his crimes, who’d merely posted for sale jewelry and art he’d created on Facebook. Which prisoners can do in mainstream and independent print media and is perfectly legal in any media. The TDCJ isn’t suddenly going after prisoners’ access to social media because of any of its stated concerns. 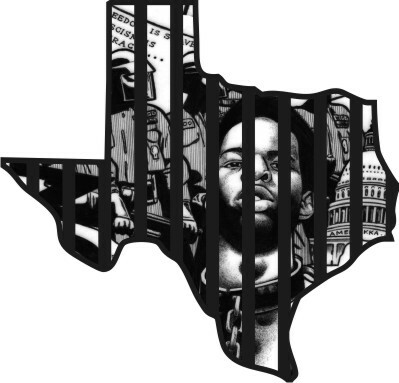 The real concern is prisoners’ use of social media as a platform to expose the actual inhumane conditions and abuse that pervade TDCJ’s prisons. This because several such initiatives are already underway and proving to garner public attention and support for prisoners against these conditions. This is an example I have struggled to set for other prisoners through writing and posting articles and exposés on prison abuses online myself. This sort of work serves to increasingly humanize prisoners to the public and to expose the inhumanity of our living conditions. This counteracts officials’ long practiced policies of dehumanizing us in the collective public mind and thereupon being able to get away with treating us in the most overtly racist and brutal manners with utter impunity. They recognize also, as I’ve often noted in my articles, that today’s exposure and mass movement against murderous police practices in communities of color, which has been going on but hidden in plain sight for ages, arose solely because it was exposed by the victimized communities themselves as the world witnessed it on social media. They fear the same thing occurring with regard to prison abuses in Amerika, Texas in particular, which is widely regarded as Amerika’s most abusive prison system. What’s Texas Got To Hide? Some might ask what Texas prison officials have to hide, that would make them want to muzzle their prisoners. We who live in their prisons know the answer all too well. For those who don’t live in them, comprehending the extremes of official corruption and abuse that pervade them would require a major readjustment of many cherished beliefs about their government. And it’s not merely attributable to a handful of low-ranking rogue guards. Rather, it is pervasive and reaches up to the highest levels of authority and is an institutional practice. I can give an example from my own personal experience that is confirmable by official records. That example is found in the person of one David Forrest, who was the highest ranking security official (Major) of the Estelle 2 Unit (E2U), in Huntsville, Texas when I was first assigned to the TDCJ in 2013 from the Oregon prison system. In an article I wrote that year I described an incident that occurred on that first day at the very moment that I got to E2U, where I was taken into an office handcuffed from behind and leg shackled, whereupon Forrest and a Captain James McKee proceeded to hit me about the face and head repeatedly and to choke me, as an Assistant Warden looked on, and hurled curses and threats at me. What’s striking isn’t so much what happened to me, but rather Forrest’s known history of these and worse abuses, and despite this (or perhaps because of this), he has been rewarded with ranking positions where he can more effectively carry out and oversee such abuses. After I’d written that article, one of my publishers made an open records request to the TDCJ for information on Forrest. What he received was a stack of documented investigation summaries on Forrest in the TDCJ spanning from 1987 through 2012. Forrest had been the subject of no less than 40 separate investigations by the TDCJ’s central investigation department for misconduct, typically beatings of prisoners. Yet he steadily rose through the ranks, and ultimately achieved the rank of chief Warden of a private Texas prison, operated by Wackenhut (now GEO Group). In that capacity Forrest oversaw, and colluded in the coverup of, the gruesome murder of a prisoner, Gregorio de la Rosa, Jr., who was beaten to death; Forrest was reported by other Wackenhut guards to have laughed about the murder. The dead prisoner’s family then sued Wackenhut and Forrest for wrongful death, negligence, and gross negligence. The jury found in the family’s favor and awarded them a total of $47.5 million in damages, including $20 million against Wackenhut and $500,000 against Forrest in punitive damages. The court found that Forrest repeatedly lied in his testimony and erased key video footage of the beating. The defendants appealed but the Court of Appeals upheld the verdict. In referring to the destroyed evidence and Forrest’s false testimony, the Court stated their conduct was, “clearly reprehensible and, frankly, a disgusting display of disrespect for the welfare of others and for this State’s civil justice system. … Moreover, Wackenhut’s conduct in maliciously causing Gregorio’s death and thereafter spoliating critical evidence so offends this court’s sense of justice that a high ratio [of punitive damages to actual damages] is warranted.” These are the sorts of characters (like Forrest) that the TDCJ employs and promotes to its ranking positions. Recall, that all the parties to my attack at E2U were the highest ranking staff at the prison; a Major, Captain, and Assistant Warden. And the Unit they presided over was particularly brutal and inhumane. The thing is, if the public knew about these things, and they were linked with prisoners’ loved ones and supporters, it would not be tolerated, and could well generate a protest movement on a par with that against the murderous police in communities of color, which was sparked by exposures and organizing on social media. Again, this is the true reason the TDCJ is acting to ban prisoners’ access to social media outlets in direct violation of the law. Its other proclaimed reasons are but pretexts and lies calculated to cloud the public’s judgment with appeals to prejudice, fear, and hate. We should not be swayed and should assert prisoners’ right like everyone else to freedom of speech and the use of all media forums to this end. See, Death Penalty v. Ryan, 269 F. Supp. 2d 1199, 1202-03 (D. Ariz. 2003). Olmstead v. U.S., 277 U.S. 439, 485 (1927). Matt Clarke, “Texas Court of Appeals Upholds $42.5 Million Award Against Wackenhut/GEO Group,” Prison Legal News (June 2009), pp. 10-11.